Even before the group’s official debut, the 11 bandmates had stolen the hearts of millions of K-pop fans, making headlines under their group name Wanna One. 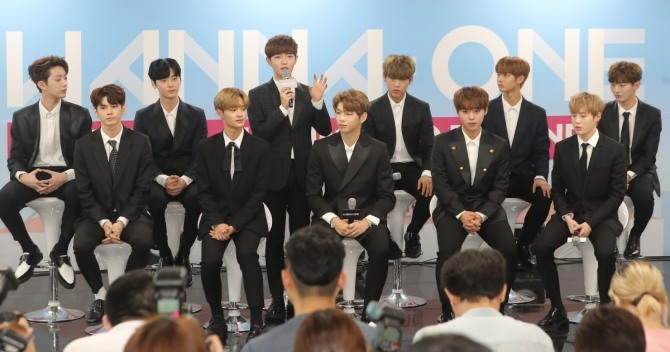 The heartthrobs from Wanna One, a project boy band formed with the 11 finalists of Mnet TV competition “Produce 101,” debuted with its first EP “To Be One,” featuring double lead tracks “Burn It Up” and “Energetic,” which were prereleased through an event during which fans got to decide the album‘s lead tracks. Viewers, dubbed “national producers,” had voted for their favorite trainees from among 101 contestants. “We can’t believe that we are finally making it,” said the bandmates in unison during a press conference held at Gocheok Sky Dome in western Seoul, where they were scheduled to hold a debut showcase-concert later the same day. Still new to the K-pop scene and unfamiliar with the press, the band looked stiff and nervous in front of the rows of reporters. 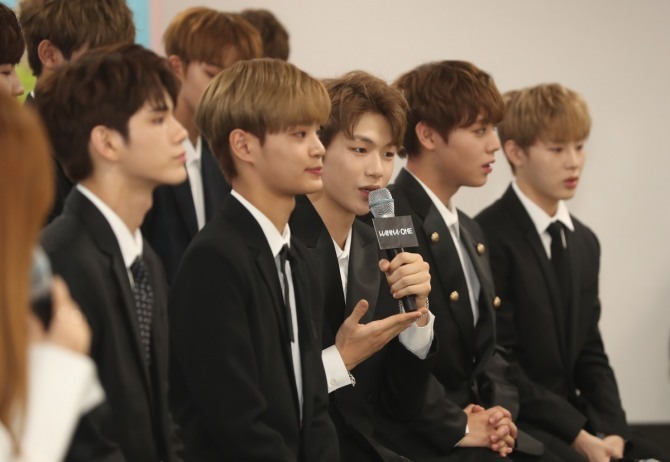 Some were confused with the reporters’ questions and mumbled answers, but one thing for sure was that they were highly excited about their debut, made in the midst of explosive anticipation from both the fans and media. The bandmates, who had all been trainees to become K-pop stars under different agencies before competing in the TV talent show, said performing at Gocheok Sky Dome was something they had never even considered. Maybe it was more than a mere dream-come-true for Wanna One, as the act became the first K-pop rookie group to kick off with its first performance at the stadium with a seating capacity of up to 20,000, where big-name acts such as BTS and EXO have thrown concerts in the past. 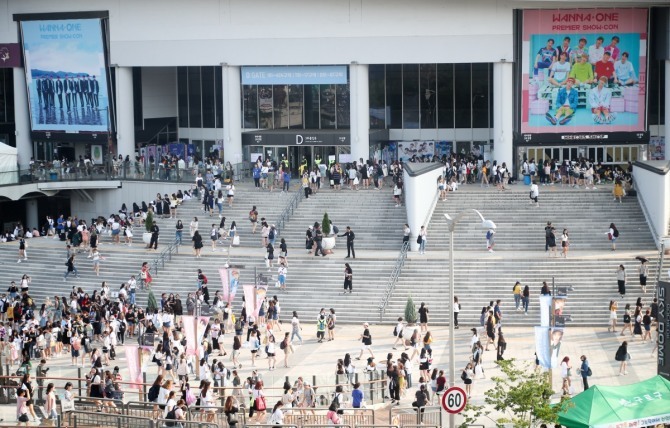 “I visited this Gocheok Sky Dome to see BTS’ concert in the past. At that time, I thought, ‘When would I be able to perform at this place?’” said Ha Sung-woon. “We’d like to dance and sing to our best to offer you joyful memories here,” Hwang added. Wanna One released “To Be One” on Monday at 6 p.m. The project boy group will stay together until Dec. 31, 2018.